In Windows 10, updates are downloaded without notifying you. 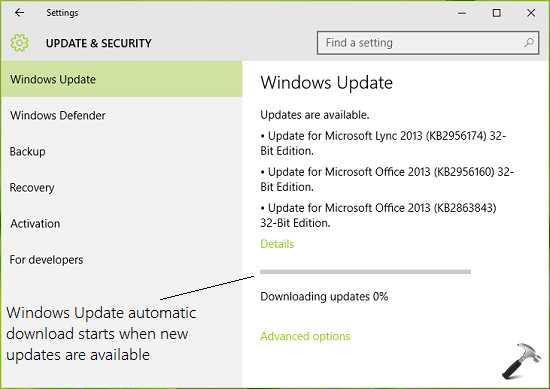 Here are the ways to avoid Windows Updates automatic download and install in this OS. Thus, if you agree to the points mentioned above, that means you don’t want to let Windows download updates automatically. This also shows that automatic Windows Updates download suits only those users who have unlimited data bandwidth. NOTE : Local Group Policy Editor is only available in Windows Enterprise and Pro editions. For other editions, refer Method 2. 4. In the above window, select Enabled option and then choose 2- Notify for download and notify for install entry under Configure automatic updating section. Click Apply followed by OK. Close the Group Policy Editor. NOTE : The policy setting changes will not reflect immediately and you may need to have few reboots to make changes completely effective. We’ve found that Windows Updates aren’t downloaded automatically for Metered Connections. Hence to solve this issue, you can set your network connection to metered one. 1. 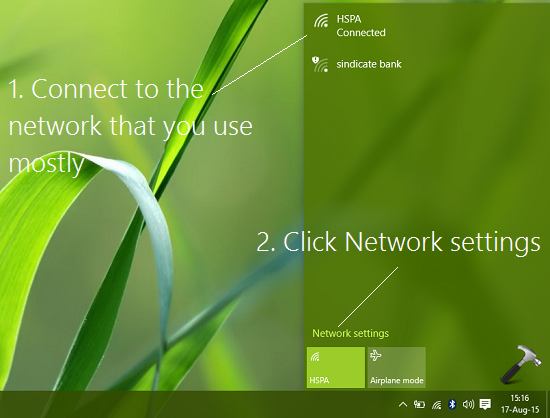 Go to Desktop, click network icon on taskbar and connect to your network connection. Click/tap Network settings link then. 2. Next, click/tap Advanced options link in the Settings app window so opened. 3. Finally, in the next window, set the Set as metered connection option to On. Hope this helps! Go here to learn how to manually reset Windows Update components. Thanks for directing me to this page. I did the gpedit.msc edit and set the connection as a metered one. It now waits till I click Download. But it does not let me select what to download, or hide updates. I get a message “some settings are managed by you organization”, in the Windows update page, even though it is a personal laptop. The Powershell way appears to be the best, as it allows to select the updates control the update process. Thanks Kapil, you are the real MVP, Ur rockstar brotha! :) 2 thumbs up! I want my machine like it was a 1/2 hr ago!! !Leave me alone and my machine. I liked it like it WAS!!! Stop pushing YOUR idea of what WE want!!! Hello Kapil, thanks you so much for so helpful info, I have been googling but I found nothing, please let me know if you know a way for Setting ALL Network Connection As Metered BY DEFAULT ? ^^ Sorry Ricardo, but that is not available with any of Windows 10 version till now. Hello Kapil thanks for reply :D I have not try yet but, I think I figured out, base on a post of other site. +Change owner of DefaultMediaCost key (left pane) to Administrators group. +Set permissions of the key to “Allow” the Administrators group “Full control”. +Change owner of DefaultMediaCost key back to the default NT SERVICE\TrustedInstaller. then I can not “Get updates for other Microsoft products” neither, the switch for “Give me updates for other Microsoft products…” turn gray (disable), I do not want updates be automatic but I do want update manually including other Microsoft products too. ^^ I am not aware of that registry manipulation but have you tested it? Is it working? ^^ Thanks Ricardo for confirmation, but I was referring to registry manipulation for metered connection. Is it working as well? ^^ Alright Ricardo! I’ll check it on my system and if it works, I would write an article on that with of course, credits to you. Happy new year!